My first laugh of today !!!! Have a great thanksgiving . Eat lots of food!!!!!! I've never gotten a Chia..but I'm the sad recipient of many a pastel, airbrushed sweatshirt! I would probably think that was an amusing gift to give or receive. Ack, I'd probably be the bad gift giver. I think an Elvis Chia-head would be awesome! Oh my, we always gave those as gag gifts for gift swaps! Ha! That's one of those gifts that you open up, smile and pretend really hard to like it! You have to post this to the link-up when it is open on Monday. I think my dog Samson would make a great Chia Head -- all that fur -- I could just let the sprouts grow and grow and grow! Call me quirky, but I'm lovin it! LOL! This was always a gift I never wanted to get or even give. My mom received this as a gag gift from her boyfriend one year. Hilarious! WOW! I didn't even know they had these anymore! I never got one nor have I ever known anyone that did. But man, that head reminds me of a Smurf! Isn't there a "cat grass" Chia Pet? My husband's uncle gave my kids chia pets complete with an alarm clock that played the cha-cha-cha-chia song. Yeah. Lost that one fast. 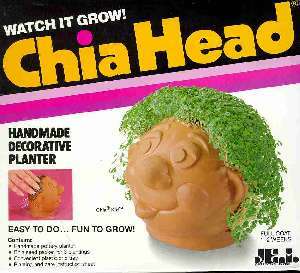 I found a chia pet at a yard sale, and I thought I would give it to someone as a gag present. Well, as soon as my young son saw it, he wanted to do it; so we did. The end. Just read the nice comment you left me, and yes, I am now a happy follower of yours...though it took me a bit of time to make the danged thing work! So funny!!! Stupid Chia head. I got one of those Chia pets once. We found the best use for it was to use it as a white elephant gift. The funny thing is I saw it pass throught the gift exchange a couple more times on different years. And then,yip you guessed it,one year I got it back. LOL.... I just grew a chia head last year. Wanted to stop by and say Happy Thanksgiving. I "won" a Bart Simpson chia head at last year's neighborhood Christmas party. The seeds never sprouted. Ha.. I got a cat one in college, but it was at my request. Some of the girls on my hall thought they were funny, too, so it was like our little pet. I have, however, gotten plenty of ugly sweaters from not-so-stylish family members. Happy Thanksgiving!